The article on Alfredo is coming out in the next issue, Isssue # 39 – APRIL 2006 – it’s not on the bookstands yet, but will surface any day. APRIL 14th – the issue is out. Issue # 39. It says: ART ATTACK ! New York’s Notorious Forger Returns – at the top right corner of the cover. The article, titled: ‘STUDIO GANGSTER’ (no joke !! – ) is written by MacLean Jackson, with about 4 pages of text and 6 pages of photos. The article in the SLEEK MAGAZINE is more informative of Alfredo’s caper. This one is a little more atmospheric, but its amazing how guillable both authors are – although what might seem the strangest fiction are probably the truest facts .. its the little details that keep changing … a detailed comparison of both articles will give some indication as to how Alfredo continues to embellish his myth-in-the-making. The photos by Axel Dupeux are the best part of the article, and got top priority, even including some full page photo layouts. 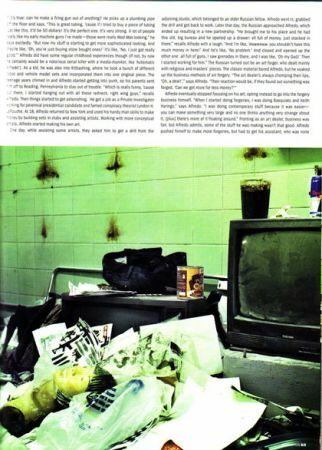 The green tinged photos are from Alfredo’s ex-studio (with ‘the plumber’,) next to the Gowanus Canal – think ‘Fight Club’. (there’s an interesting ‘Red Bull’ product placement in one of these photos. ‘Red Bull’ is a sponsor of THE CANAL CHAPTER who got Alfredo this layout – .. that is, .. if you also agree that a product placement in an artist’s studio, a convicted forger no less, and just off the Gowanus Canal, might be a milestone in the history of product placement. 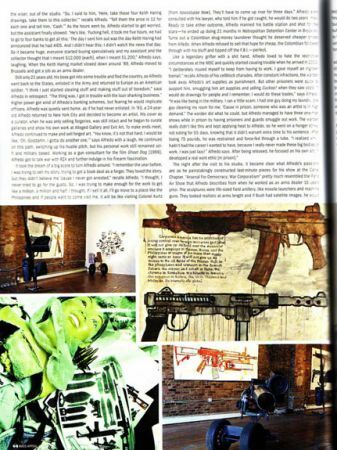 The pictures of the artwork against a red brick wall, are from Alfredo’s show: ‘ARSENAL FOR DEMOCRACY – WAR CORPORATISM’ which ran from: Jan 27 – Feb 24, 2006 at THE CANAL CHAPTER. JASON WALL & MIKHAIL (Mike) SOKOVIKOV, co-founders & directors of THE CANAL CHAPTER – aka 1134NYC – 343 Canal St – 4th FL – hooked Alfredo up with MASS APPEAL – all it took was one phone call. 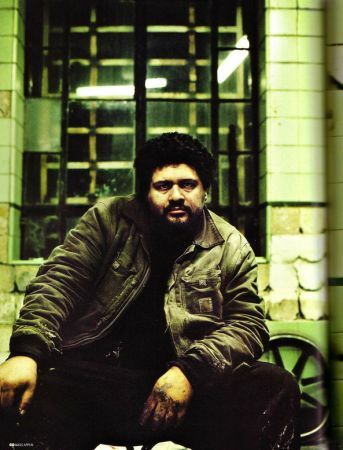 below are some scans of photos from the MASS APPEAL article, APRIL 2006 – ISSUE # 39, on ALFREDO MARTINEZ, titled: ‘STUDIO GANGSTER’ – ALL PHOTOS BY: AXEL DUPEUX.